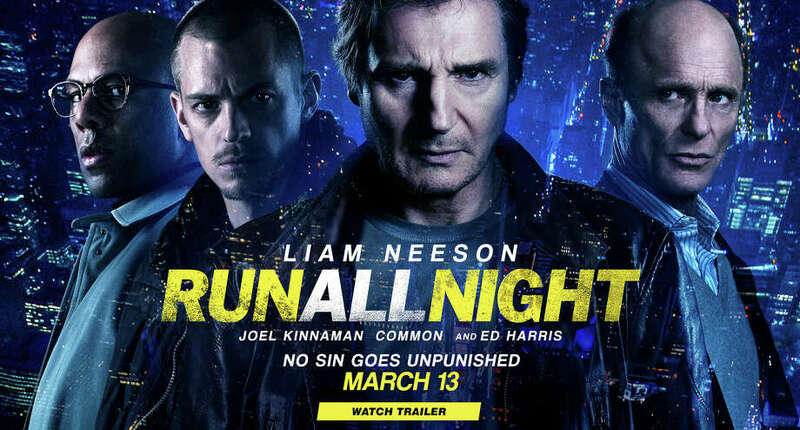 Liam Neeson, center, stars in another action movie, the new "Run All Night." Darien News film critic Susan Granger reviews the new movie, "Run All Night:"
Now that the "Taken" series has run its course, Liam Neeson is back with this action-packed saga of an aging enforcer for the Brooklyn Mob, a tough guy once known as "The Gravedigger." "I've done some terrible things in my life," admits conscience-stricken Jimmy Conlon (Neeson), an alcoholic loner whose estranged son Mike (Joel Kinnaman) is a family man with two daughters and a third child on the way. Jimmy's only friend is his ruthless boss, Shawn Maguire (Ed Harris). They grew up together, with Shawn now rich, respectable and ready to retire. Problem is working as a limo driver, Mike is an innocent bystander when Shawn's cokehead son Danny (Boyd Holbrook) commits a reckless drug-related murder. When Danny is killed in a subsequent shootout, Shawn blames Jimmy, so he and Mike are forced to go on the run from corrupt NYPD cops, the Albanian gangsters and Shawn's hired hitman, Price (hip-hop artist Common). Vincent D'Onofrio appears periodically as a homicide detective who has spent the past 30 years trying to put Jimmy behind bars for various crimes. And grizzled Nick Nolte plays Jimmy's brother, another professional killer. Collaborating again with Spanish filmmaker Jaume Collet-Sera ("Unknown," "Non-Stop"), Liam Neeson does his best with the contrived, improbable script by Brad Ingelsby ("Out of the Furnace"), which formulaically unfolds during one single night. Filmed on location in New York, the frantically edited chase goes from Madison Square Garden during a Rangers vs. Devils game through the subway and trains systems into different boroughs, utilizing tracking and aerial panning. On the Granger Movie Gauge of 1 to 10, "Run All Night" is a gritty, fast-paced 4 that's quickly forgettable.